Can-Am President, Ross Millar and his team received a gift of appreciation celebrating the ten-year relationship forged between his team and Equine Guelph. Accomplished artist, EquiMania! 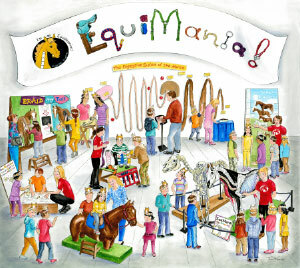 volunteer and long time friend of Equine Guelph, Ruth Benns created a beautiful painting depicting a typical jovial scene of the ever-popular EquiMania display. The specially commissioned artwork was presented to Ross Millar, Mike Straw and Ron Waples in the main arena on Can-Am’s Saturday night to help kick off the extravaganza show to a sold out crowd. "Can-Am Equine Expo is proud of the relationship with Equine Guelph that is based on promoting the welfare of the equine while also educating people young and old on the equine world,” says Ross Millar. “Gayle Ecker and her staff always partner in a most professional manner and we look forward to a continued relationship in the future." EquiMania! 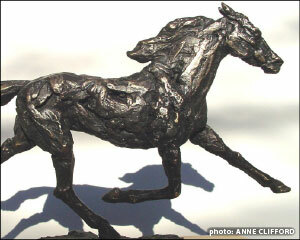 has been featured at the Can-Am Equine Expo right from it’s debut. The once little booth aimed towards teaching kids to be safe around horses has grown up with Can-Am to educate and entertain thousands of horse lovers of all walks of life. This year, the now 5,000 lb display occupied an entire barn, bringing it’s interactive, fun way to learn about horses and safety to the multitudes who attended. Equine Guelph would like to pay special thanks to the artists who offered donations of proceeds from their booth sales and through donations of artwork auctioned off at the Saturday evening extravaganza: Ann Clifford, Wendy Fraleigh, Nola McConnan of Merriweather Studio , and Winnie Stott with the equine artists of Winsong Farm .